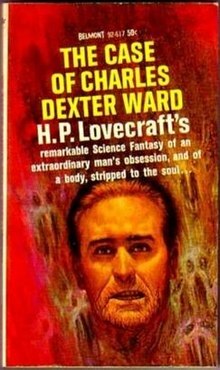 The Case of Charles Dexter Ward is a very interesting tale of a young man that discovers the eldritch past of a long forgotten ancestor. Filled with the vivid descriptions common in H.P. Lovecraft's works, this story harshly describes why it is often in one's best interest to avoid tumbling down certain rabbit holes. In Charles' case, that rabbit hole, unfortunately, leads to an occult-like spiritual world that would make Aleister Crowley tremble. H.P. Lovecraft always amazes me with his lush descriptions of the grotesque and abhorrent scenery that the protagonist helplessly finds themselves in, but as usual, when you get to an actual creature he intensely and verbosely describes how it can not be described due to sheer horror. The events at Curwen's farmhouse, the moaning creature in the pit within the moldering and dripping catacombs, all begging in vain for more detail, only to manifest into something words can not describe. Two can play that game Mr. Lovecraft. "He trembled as his torch slipped from his grasp and fell upon the cold hard stone of the crumbling ancient temple. The deafening tone from the impact of this object reverberated throughout the corridors of the large chamber. His heart began to beat faster and faster as he vaguely saw a shadowy figure crawling closer and closer. As it slid across the floor it produced a gelatinous cacophony that pierced the very bones in his body. With the last of his strength, he quickly picked up the torch only to come face to face with a terrifically deformed creature beyond description. It let out a terrible cry so powerful that to torch went out and only darkness remained." See?! How does it feel! I bet that creature was terrifying! Was it a decaying humanoid? An animal? An interdimensional being? I guess we will never know. But in all seriousness, the story is fantastic and it is sad to know that H.P. Lovecraft never had it published while he was alive because he felt it wasn't a very good story. I and many others believed this to be one of his better novellas. Do not call up Any that you can not put downe, by the Which I meane, Any that can in Turne call up somewhat against you, whereby your Powerfullest Devices may not be of use. Ask of the Lesser, lest the Greater shall not wish to Answer, and shall commande more than you. Young Charles did indeed call up something that he could not put down, Joseph Curwen. His curiosity and trust blinded him to the pure evil that was embedded in the soul of Curwen and, to my dismay as a reader, the toll in doing so was Charles' life. Take heed in this lesson the next time you attempt to control something beyond yourself, as it might be your undoing. I rate this story a 4.2 out of 5. This was one of my favorite H.P. Lovecraft stories. It was rather long for Lovecraft, sitting at approximately 120 pages but was well worth the read and will be read again in the not so distance future. At this point, I have read almost all of H.P. Lovecraft's incredible stories but this particular one probably touched my soul the most, and that was within the last few pages. If you enjoy happy endings, look elsewhere.